« 2007-09-20 Let it snow! 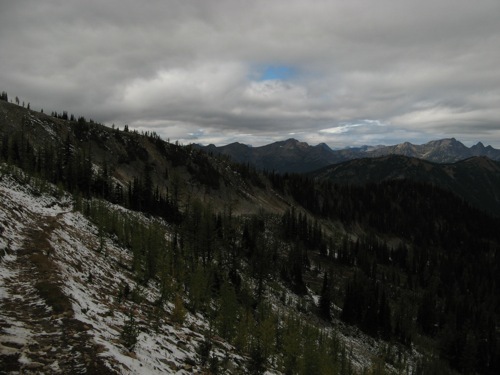 This entry was posted on Friday, September 21st, 2007 at 3:43 pm	and is filed under Camp, Hiking, Photo, Washington. You can follow any responses to this entry through the RSS 2.0 feed. Both comments and pings are currently closed. Hope the sun shines for you all. Last day on the trail must be a heady experience rife with trail magic, nostalgia and a growing sense of accomplishment. I can’t wait to hear of it! Also, I hope to hear of all the reunion goings on after the trail ends – perspectives of other hikers, too. You rock, man. Almost there – you must be able to smell the maple syrup and pancakes! and we want to see a video of that. Get one of the noodleheads to film it for us.